The bike industry, like any other, has repeated fads that are designed to separate us consumers from our money. The latest fad is fat bikes – bikes with tires greater than 4″ wide tires. The original idea was a bike that you could ride on snow. I guess it was invented by crazy cyclists in Alaska or something. The hype though goes far beyond riding in the snow – people kept telling me how amazing the big tires are on dry land as well. This winter after too long of not being able to get out onto a bike, I joined the club. My goal for having a fat bike was purely riding in the snow – getting out in the winter when nothing else was ride-able. I had a good few very nice rides on snow around Boulder and up at Brainard Lake and really enjoyed riding it. You can’t get on a fat bike and not smile, it is just so much fun. I really thought that I would be putting it away for the year though as the snow is melting. 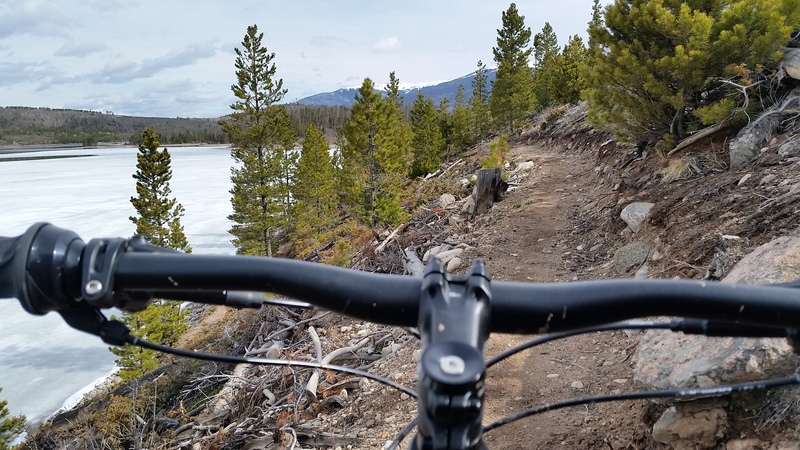 I decided to take the fat bike on a trail in the high country that was almost entirely snow free. There were a few places in the trees that had some deep snow, so I figured a regular mountain bike would do it, but mostly the trail was nice flowing single track. Long story short, it is super fun. I didn’t miss having a suspension at all on my rigid fat bike – 5 inches of tire is plenty of suspension I guess. I guess the bike industry has done a fantastic job of separating me from my wallet. It seems like my lovely wife will be needing one next winter.